I was in the library recently, and saw Michael Smith's Elements of Style. I had heard a lot of good things about this book, so I decided to check it out. 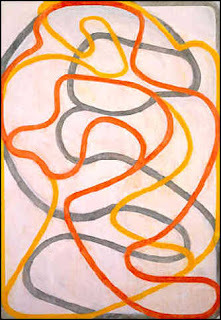 On one of the first pages I came across this beautiful image (above) - a truly outstanding piece of contemporary art by Brice Marden. 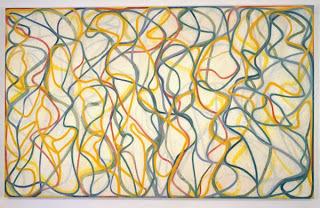 Brice Marden, Vine, 1992-93. Museum of Modern Art, New York. I do not profess to be an expert on contemporary art by any stretch, but how is it that I have never heard of or seen the work of this artist? He is considered to be one of the most important American artists of the contemporary period. 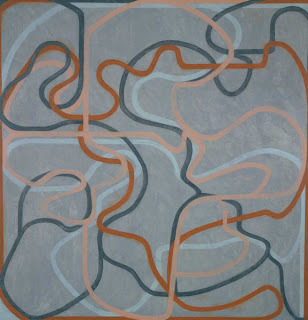 Brice Marden was born in 1938, and is known for general abstraction and a highly individualized palette of muted colors. 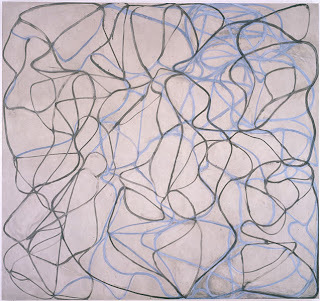 Brice Marden, Study for the Muses, Hydra Version, 1997. Matthew Marks Gallery, NYC. Brice Marden, Attendant 5, 1996-99. The styles depicted above are just a part of Marden's portfolio, but are the ones that had the most appeal to me. The calligraphic-like swirls of these pieces are so beautiful. I am not surprised that one of Marden's influences is Chinese calligraphy. I picked up Michael Smith's book hoping to learn a bit about interior design, which I did; however, the greatest discovery from the book is a new artist whose work truly inspires me. Now that is a good thing. now this is weird - I have read that book a thousand times and never noticed that art work! strange how different things attract different people. great post. sigh. i too, have always admired those "squiggle" paintings by marden. These are so interesting to look at - thanks for sharing! I've taken more of an interest in art lately and the squiggly lines with the colors are a lot of fun! Thank for the great post! Charlie Rose interviewed Mr. Marden. Check it out, there are a bunch of his paintings shown in an exhibitions so you can how big, spectacular and "squiggly" they are. Terry - thanks for the link to th Marden interview! After watching bit of it, I realized that the Tate Modern (London) has some of his work. I am not sure if they have the 'squiggle' style, but they have some of his other works. I think his pieces are somewhat calming. You can just sit and try to follow the slowly curving lines for hours. Love the work, it has inspired me to think about what I want over my bed. Nice blog happening here. I'm never at ease with contemporary art, but as Ms. Gunn points out, these are calming. And no, this is not something that my children could have done. I've admired his work for 15 years. The New Yorker did an eloquent article on his work about a year ago. These would be so fun in a more traditional styled home, well any home for that matter. Thanks for sharing! !